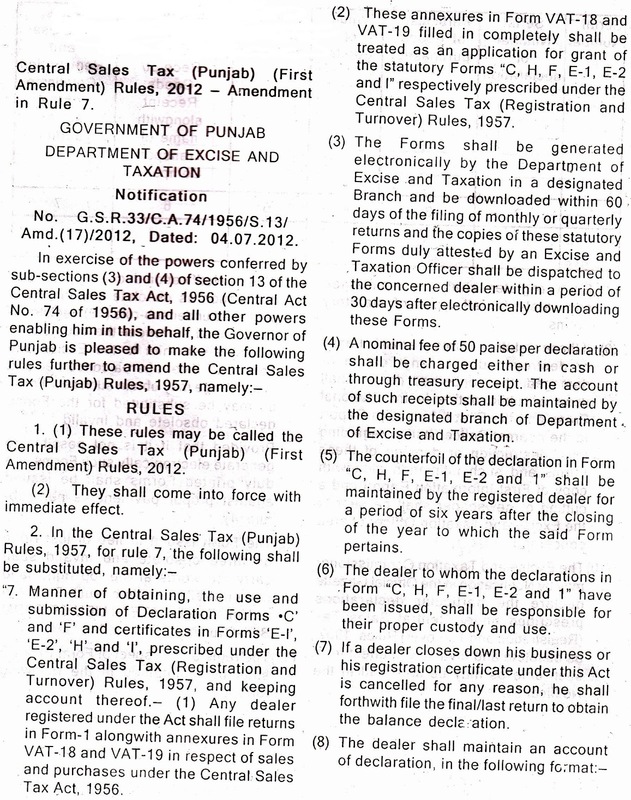 Rule 7 of Central Sales Tax (Punjab) Rules has been amended to provide for the issuance of online statutory forms i.e C, F, H, E-I, E-II and I forms under Central Sales Tax Act, 1956. The rules provide for compulsory filing of returns in the Form-1 and VAT-18 and VAT-19 by every dealer registered under CST Act. VAT-18 and VAT-19 return forms will be treated as application for grant of statutory forms"C, H, F, E-1, E-2 and I. It seems that if VAT-18 and VAT-19 return forms are to be treated as application for the issuance of statutory forms then filled up statutory forms may be issued after generating the same electronically as per VAT-18 and VAT-19. 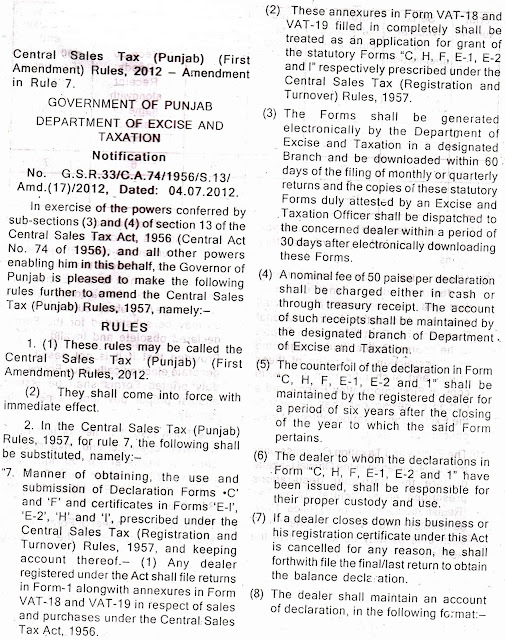 There is no provision for revised return under Punjab VAT Act, 2005 , hence if there is some bonafide mistake say some invoice is missed in the return form VAT-18 or VAT-19 then it will create difficulty for the issuance of statutory form for that missed invoice during that period. 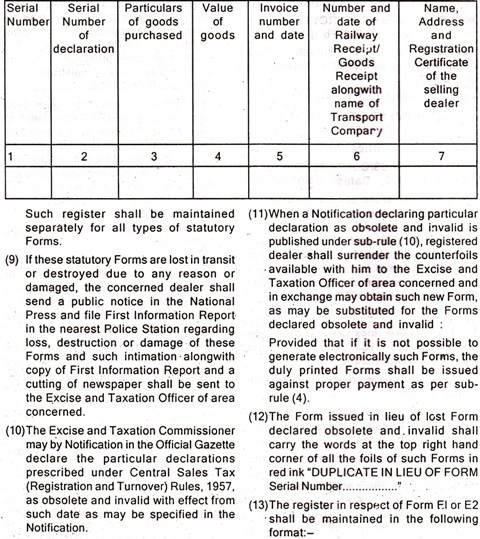 As per theses new rules the statutory forms shall be generated electronically by the Department of Excise & Taxation in a designated branch and be downloaded within 60 days of the filing of monthly or quartarly returns,thereby after attestation by Excise & Taxation Officer the forms shall be dispatched to the concerned dealer within a period of 30 days after electronically downloading the forms. The fee for the statutory forms has been kept at 50 paisa per form. The rules also provide for the procedure in case the forms are lost in transit or are destroyed or damaged. In such case the concerned dealer will be required to lodge FIR and also will have to give a public notice in the national press and has to send intimation for the same along with a copy of such public notice as published in newspaper and the copy of FIR to the Excise & Taxation officer of concerned area.